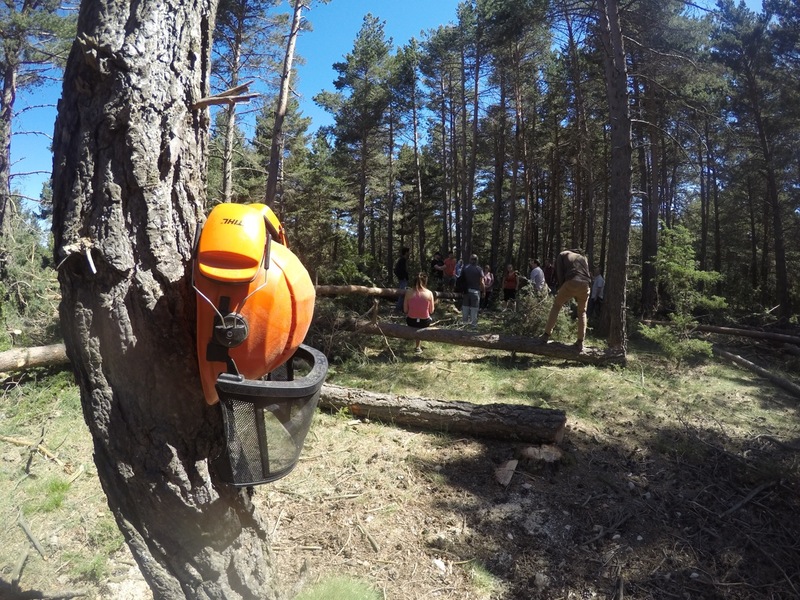 Forestry fun – for people. for nature. Today was a fascinating day! 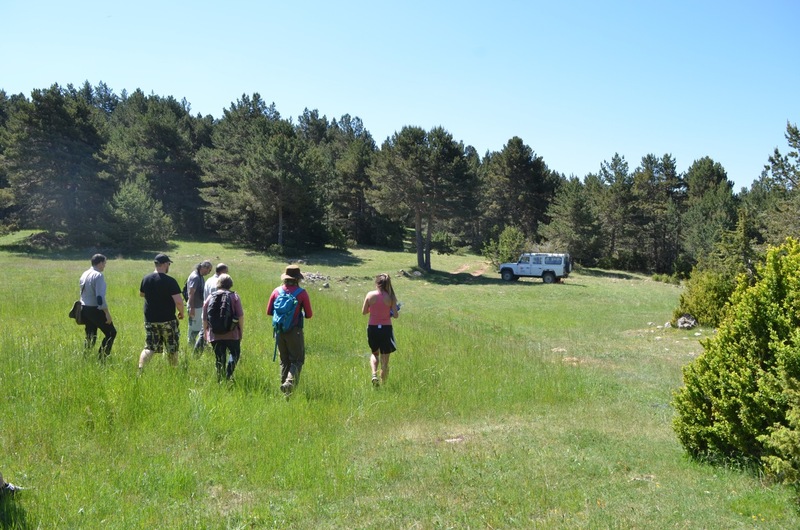 We went with the students again, this time to a forest management project. The area we visited was much higher than where we are staying in Alinya. 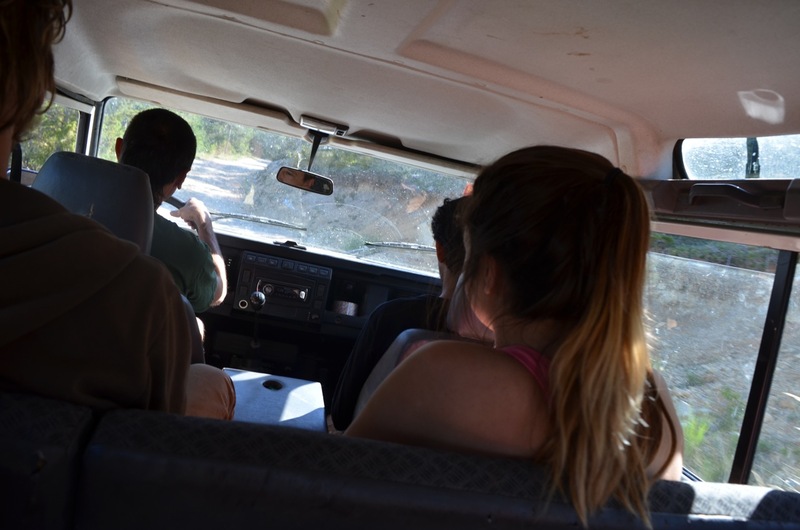 Our ride for the day was a trusty Landrover Defender. We definitely put it through its paces grinding up the mountain on a rutted dirt track! The project area used to be used for agriculture (growing potatoes and grazing) but now a lot of the land has been abandoned and with no grazing pressure the forest is growing back over the small areas of grassland. That could be considered quite a positive development, but here they are not so keen on having unbroken wild forest. 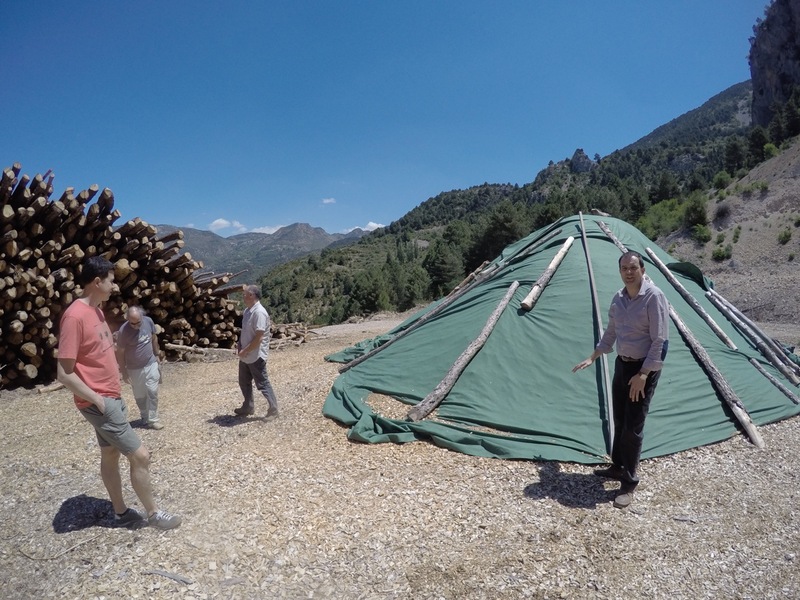 The Foundation that owns the land has started a project to develop the new woodlands into a commercial forest that will preserve some areas of open land, and provide job opportunities (as lumberjacks) for people at risk of social exclusion – mostly due to mental disability. We learned that the project is run on a not for profit basis, but it is also unfunded. The Manager’s job is to ensure employment for as many people as possible, to preserve grassland areas AND to balance the books exactly – he can’t make a loss. Not an easy task when he is working with poor quality timber in a remote mountainside with only a gravel track for access! The one advantage is that the Foundation allows use of the land for free, reducing the cost base. All this was explained to us, after which Anna dropped the question “so if it isn’t profitable, why not just leave the trees where they are?”. I was waiting for it, but still enjoyed it when it came. The answer was that the Foundation’s priority is people, they want to use the land to provide opportunities for people to work, while managing the land in a sustainable way. We could see that the trees we were standing under were only 50-60 years old. 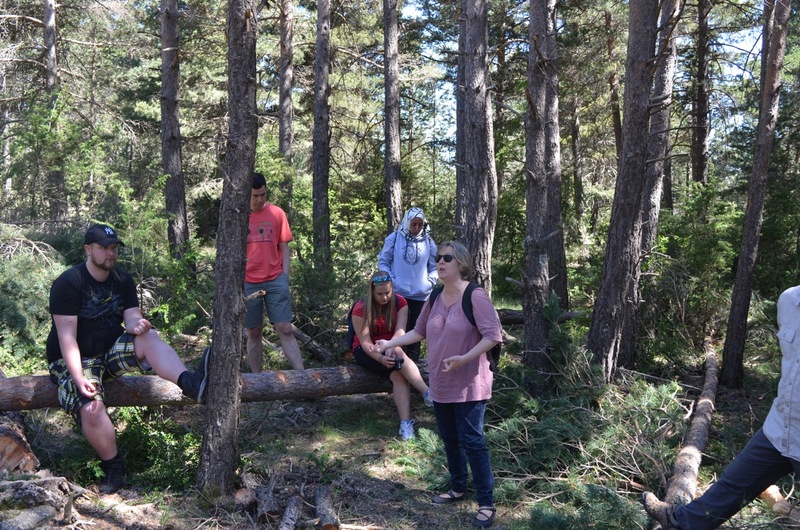 We learned from one of the Professors that Spain was mostly deforested during the days when Spain was a superpower (building the armada among other things), and that was only turned around beginning in the 1930s with a huge reforestation program, which even continued under the Franco dictatorship. 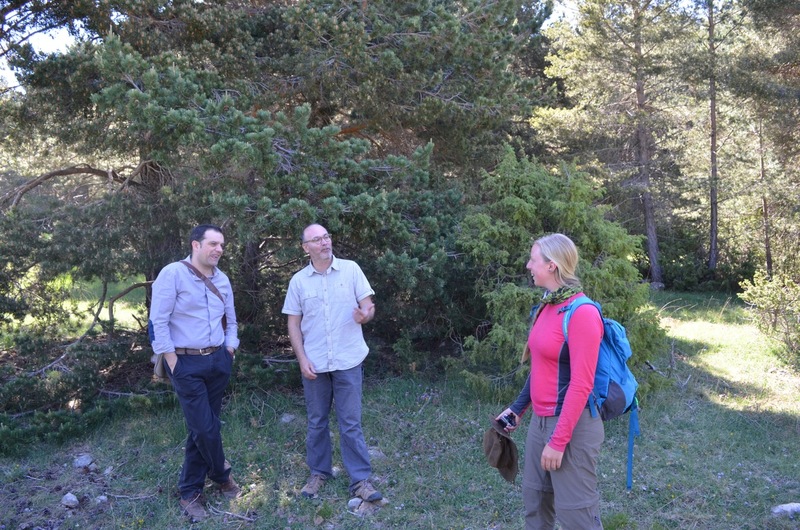 So Spain has a lot of young forest but hardly any old growth. 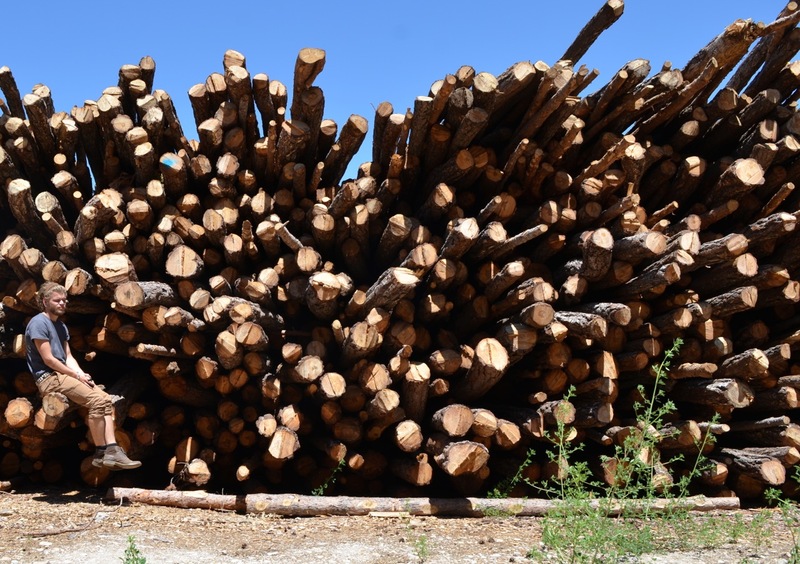 The forests are now expanding naturally; approximately 65% of annual growth is harvested per year, meaning 35% of annual growth is left standing. In areas like the one we were in, this is considered a problem because the forests are encroaching on grassland. The grassland areas that are being lost contain a different ecosystem to the forest – losing the grassland means losing biodiversity. Coming from the UK where we have entire national parks full of grass, the idea of preserving grassland is a bit strange. Me and Anna want to look up how biodiverse grasslands actually are compared with forests. We think forests are better, but lets run with it for now! We went to an area where the lumberjacks had just been working. The Manager told us that in this stage they are basically clearing out the crooked or otherwise non-uniform trees to allow more space for the straight ones to grow – this will make them more profitable when they are harvested in 10-15 years’ time. The wood that is felled now will either go to the sawmills as lower grade timber, or be chipped and dried for use as biomass fuel. Only the trunks are taken, branches and needles are left as they are unprofitable, as a side benefit they return nutrients to the soil and provide habitat for other flora and fauna. Approximately 50% of the standing wood is being removed during this phase. Apparently there is no need for replanting as regeneration occurs naturally, and the soil is fertile enough to cope with the removal of trees without becoming nutrient deprived. Not sure how long for though, and it wasn’t clarified at the time. Walking back across the endangered habitat! 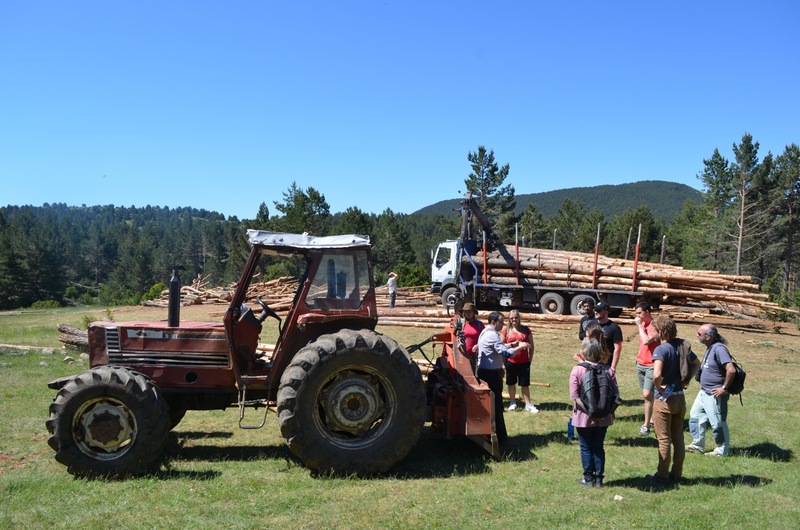 We walked back to see the logs being loaded onto a lorry for the drive to the sawmill. 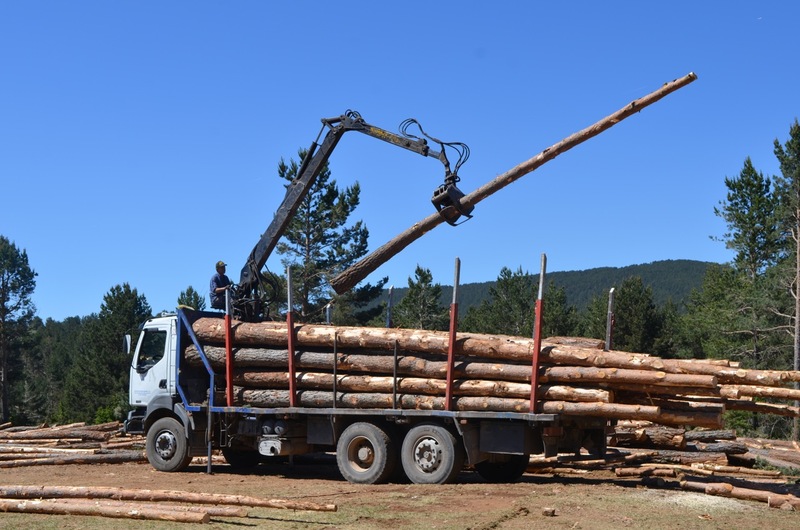 The loading was really impressive, the crane driver was working at super speed, picking up 6m trunks and stacking them neatly on the bed of the lorry. A lumberjack was simultaneously trimming the ends off a few trunks that would be too long for the sawmills. A whole lorry was loaded while we stood around chatting and admiring the old agricultural tractor that had been converted to drag the trunks to the loading area. The Manager told us that today the trunks were being sorted into 3 quality grades, but sometimes they sort up to 7 grades. On the way back to our ride, Anna posed charmingly with this potato cave, which is probably hundreds of years old and still in good condition. The potato caves were used to store harvested potatoes and keep them cool and in good condition until the market price was right, then the potatoes were taken to market in the big towns in the valleys by mule. Some are still in use, although not on the industrial scale once enjoyed here. Just after this the timber lorry came past, the driver probably dreading the tortuous road he was about to take back down the valley. Chatting to the Manager I learned that the timber on the lorry would be sold at about €80 per tonne, not much for all that growing time! The next stop was the biomass storage and processing area. 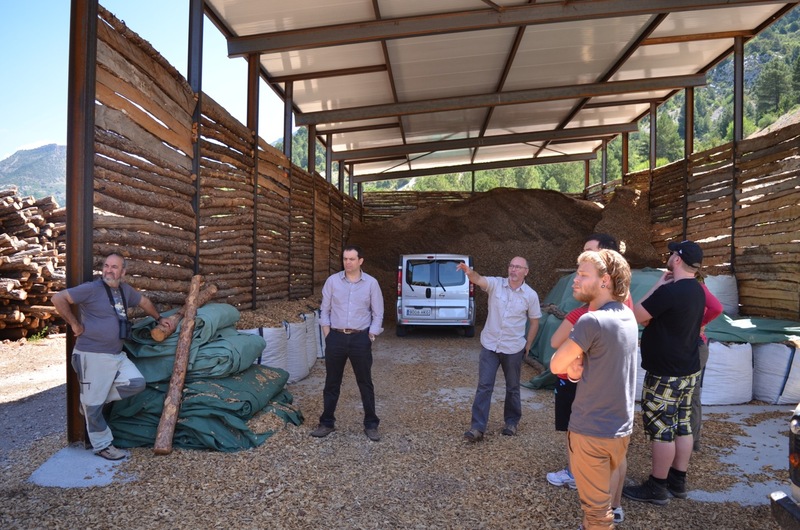 Here we learned that the trunks are stored whole for 7-8 months to dry before being chipped and sold in 1 tonne bags. The bags are sold for about €50 per tonne. The cost to produce a tonne is also about €50! The storage area is on the north face of the mountain. 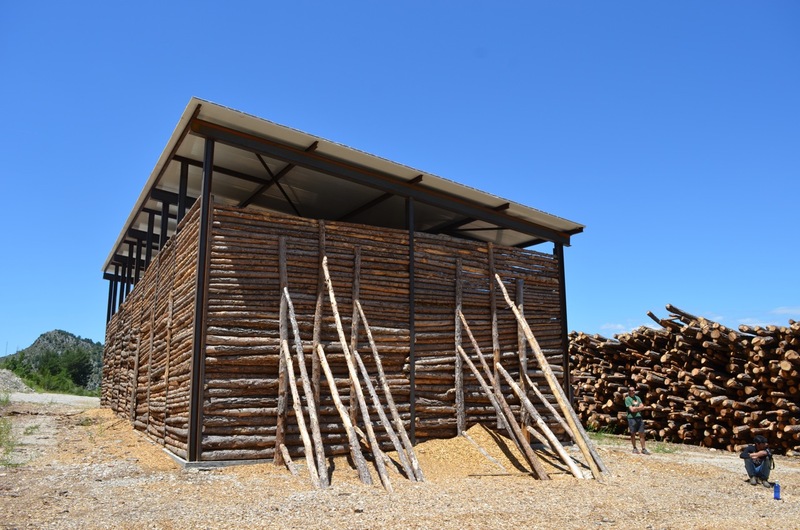 It is situated to take most advantage of the the wind, in order to dry the trunks before chipping. Wood used in biomass boilers must be as dry as possible, to ensure efficient combustion. This site acheives a biomass humidity of about 22%, which is as good as it gets without artificial drying. Here is the old storage method. It’s cheap but inefficient as you get higher humidity and you have to leave the bottom layer as it gets contaminated with soil. Here is the new shed, the Manager’s pride and joy! It was pretty empty when we visited; apparently they rent a chipper for 4 days per year, which is enough to chip a whole year’s worth of trunks and fill the shed. There is about 300 tonnes of timber in this photo. The chipper will go through this in less than a day, at a maximum rate of 9 trunks per minute! After this it was back down the bumpy track, enjoying the views of Monserrat in the distance. 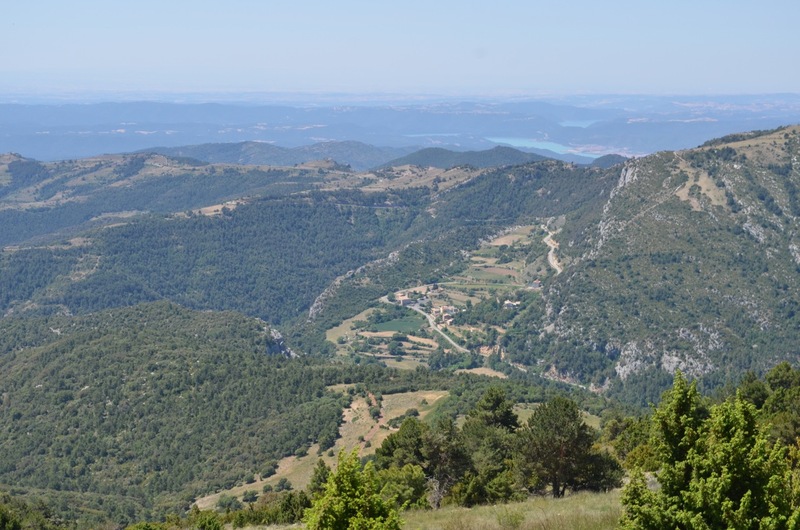 View from the road – confusingly Monserrat isn’t in this picture! We went to the hotel and had a coffee, then it was time for the students to head back to Lleida. We said goodbye then walked back to camp. 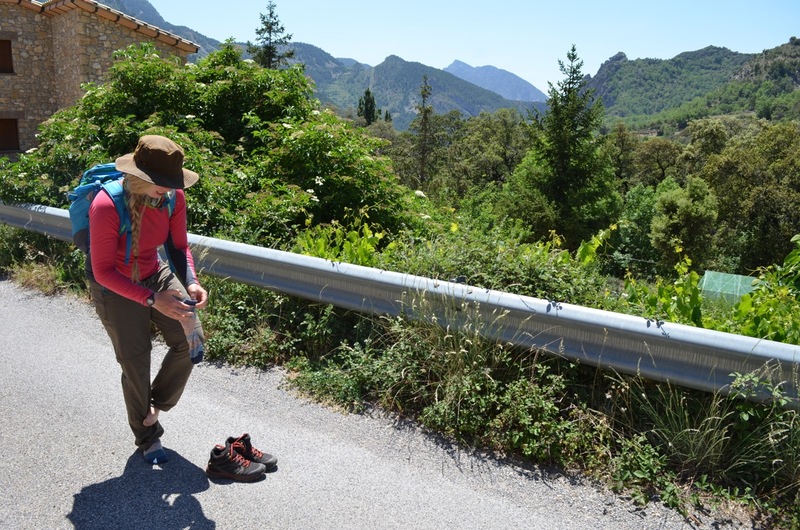 Anna had been inspired by one of the students to try barefoot walking again, but gave up after a few metres when she realised the tarmac was at about 50°C. Maybe practice on the grass is in order! 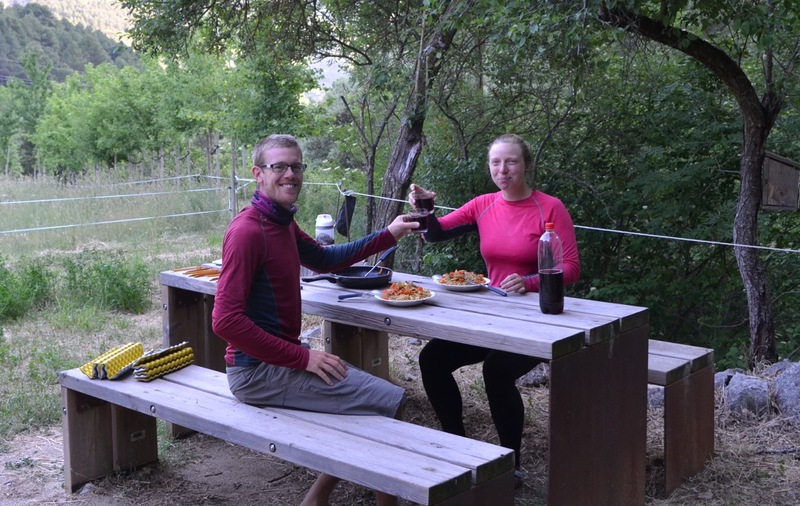 Back at base, we prepared dinner and enjoyed it with a glass of Mario’s delicious homemade wine. We were just packing away when a car pulled up and a guy came over and started speaking in Spanish. Anna tried a bit of Spanish too before we got to the good old ‘sorry we don’t understand”. We must have done better than usual though because it took him ages to try “do you speak English?”. Luckily, we do! It turned out his name was Carles (Carlos) and he wanted to camp in “our” garden. Anna said yes and started showing him round. It turned out Carles is the guide for the walk we are doing tomorrow! He lives outside Barcelona with his girlfriend (also Anna) and discovered the Alinya valley with friends one day. 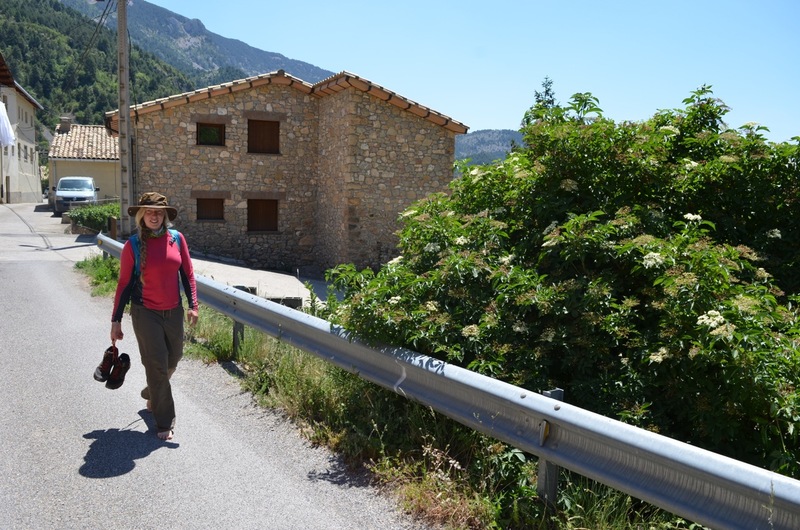 He fell in love with it and after meeting Aleix the bird expert here they decided it would be cool to run guided walks around the valley. And we get to be on the first one! Obviously we offered him some of Mario’s wine, and he provided some chorizo, so that was pretty much the rest of the evening, sitting out drinking and chatting until dark. 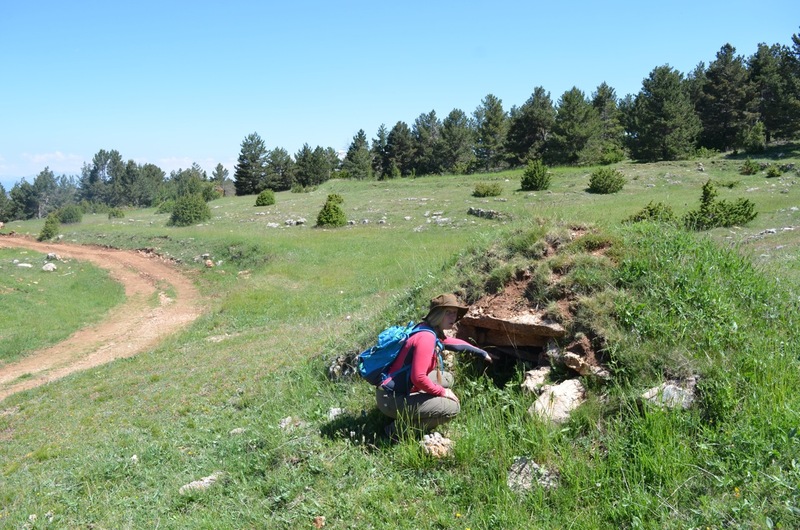 Carles had already walked the route today to check it out and told us about being harrassed by the massive sheepdogs they use here. It turns out he is also a touring cyclist and has crossed Canada the wrong way, just like Anna! He was really excited about our trip, and Anna’s grand plan to have her own big rewilding and eco-tourism project one day. He is into self-sufficiency and the transition town concept so there was loads to talk about and we had to drag ourselves away at the end of the night to try and get some sleep before the hike tomorrow! So things to ponder/research from today. Is the type of forestry they are doing here sustainable? We know that intensive forestry can de-fertilise the soil, and lead to eradication of natural forest species through removal of standing and fallen dead wood, non-profitable tree species and understorey. Some of the pine woods in the UK’s largest forest (Thetford Forest) stand in regimented rows with nothing growing between them and no refuge for anything else to thrive. That isn’t what’s happening here so far. What about the soil though? The generation time for this forest will be 60-80 years. Is that long enough for the soil to recover between harvests? Is the aim of sustaining “unnatural” grasslands in this area a good one? Perhaps before people got here, large animals, fires and big trees falling down would have ensured that there was space in the forest for grasses, legumes and scrub, and all the species that depend on those habitats. Now those natural agents have been removed, is it a good idea to try to replicate them? And does it make a difference that the act of doing that is providing employment for people who would otherwise perhaps not have a job and the self esteem that can go along with that? Another thing that was mentioned is that Cantabria imports the majority of its wood, even though the forests are growing here. 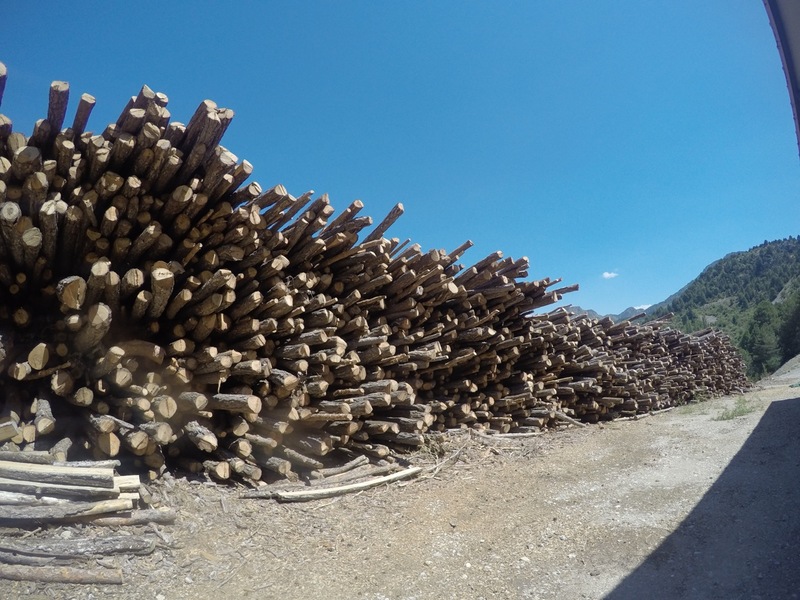 Is it better to use the wood that grows here, or try to restore Cantabria’s woodland by essentially outsourcing the damage to South America where the forests are currently shrinking? I’m not sure what I think about it all right now, but it’s definitely given me an appetite to find out more. Really interesting reading – thanks for the wonderful insight. Thanks for reading Liz, glad you liked it!